No matter how much the digital age expands, we will never rescind our love for books. Books are an integral part of human history and they continue to play an important role in shaping our culture. Today, their usage shifts from an instrument of information storage to a much more versatile design medium. Earlier this week, I showed you the well-designed ABC3D and today I will share with you a few more contemporary creative projects that reinterpret the book's look and its uses. Thomas Keeley makes modifications to everyday objects and turns them into art. His statement here? 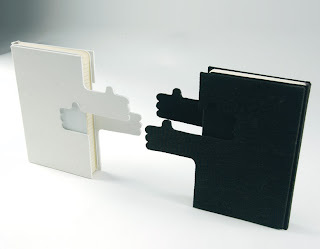 Who knows—perhaps that books love each other as much as we love them. 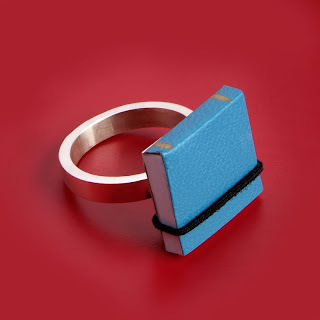 Books as jewelry? The book ring by Ana Cardim is interesting because most people do not intuitively (if at all) associate books as something that can be worn. I think that truly innovative design defies any preconceptions we may have with a pre-existing object and takes it in a whole new direction. 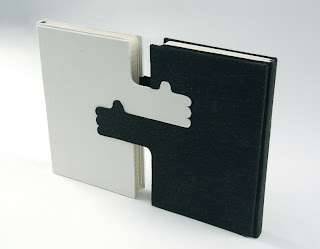 I really like this creative notepad project from Design*Sponge. 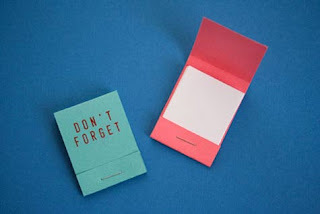 It's simple, useful, and a creative way to reuse scrap paper. 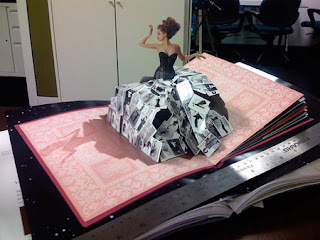 It reminds me how much fun making a booklet can be. Why are they called matchbooks, when they only carry matches? To me, this easy DIY is a better use of the term "book." Oh, hey look at me!